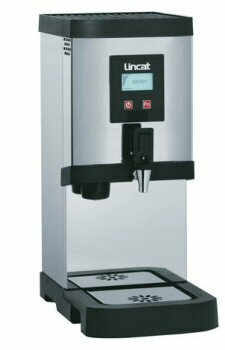 The advantage of the auto-fill boiler over a tea urn is that it will always dispense water at a constant temperature, no matter how much is drawn off. We can supply any make at unbeatable prices. The 10-litre model shown is a popular choice, as is the reduced height compact model, which will fit on a worktop under wall cupboards. All drinking water boilers in our chalky area should be protected by a calcium treatment unit.